Coping With The Loss Of A Family Pet can be a very emotional and trying time for anyone. We all deal with loss a little differently but there are a few basic things you can do to make the transition a bit easier. Growing up, I knew a lot of people who had dogs, cats, hamsters, fish and all kinds of little critters. Most of my personal friends had dogs. I’m sure that this is why I have always been partial to dogs. I spent countless hours training, playing, petting and just hanging out with my friend’s dogs. I even had one friend that told me that the only reason I was his friend was so that I could hang out with his dog. That wasn’t true, but we have always had fun with that. Although dogs were fun for me, I never really became emotionally attached to them. I think this could possibly have been because I wasn’t allowed to have my own dog at home. Until I actually got my first dog (after I got my own home), I couldn’t understand why people had such a hard time with the loss of the family pet. Shortly after I moved into my first home, I got my first dog. It didn’t take long before I found out what it meant to have a pet as a beloved friend and companion. His name was Chip, and after only a few days this 8 1/2 week old Dalmatian pup had become a part of the family. He was like a baby brother to me. This tiny, fragile, little puppy was a little guy that was trusting me to look out for him. He trusted me to provide him with food and water and teach him the things he would need to know to get through his life. We shared everything. I spent hours teaching and training him to be a great dog and a loyal friend. When I had a bad day, he could make it all go away with just a “swish” of his tail. In just a few minutes, nothing else would really matter. As he got older and his health began to fade I began to realize that his days with me would be coming to an end. It was sad to think that someday he would be gone. Even though he has been gone for some time now, I can still remember the intense pain and the loneliness that accompanied the loss of my best friend. I still think about him everyday, and I remember all of the good times we shared together. These tips on coping with grief, and the difficult decisions you face upon the loss of a peet may be of some help to you. They were for me. 1). Directly following the loss of your dog, it is completely normal to feel intense grief and sorrow. Some people (mostly those who have never owned a dog) may try to tell you that it’s silly, crazy, or overly sentimental to grieve for your dog! Don’t listen to them! Every dog owner knows that no matter how many, or how few, years you have spent together, a dog becomes a significant part of your life. They become a source of comfort, companionship, and friendship. They give unconditional love and acceptance and they fill our lives with fun and joy. So don’t worry if you feel devastated by the loss of this kind of a relationship. People who don’t understand the “dog and owner” bond will probably not understand your pain. The only thing that really matters is how you feel. Never let others tell you how you should feel. It may be extremely painful to loose your dog, but remember, you are not alone. Thousands of dog owners have gone through the same feelings. You may want to join a pet forum or area group so you can share your thought with other people who understand. Guilt may occur if you somehow feel responsible for your dog’s death. The thought: “if had only been done something differently”, always seams to go through one’s mind. A lot of us go through this, but it isn’t fair to put yourself through guilt because of a accident or illness that claimed your dog’s life. To resolve your grief, it’s best tell yourself that you did your very best for the dog and then move on. You may go through a period of denial. Denial is not accepting that your dog is really gone. It may be hard to except that your dog won’t greet you when you come home, or that you don’t need to feed it’s meals anymore. Some owners carry this to great extremes. They fear that their dog is still alive and suffering somewhere. Others may find it hard to get a new pet because they fell that they are being disloyal to the dog they recently lost. Some people have feeling of anger. It may be directed at an illness, or the driver of a car that hit your pet. It could even be directed at the veterinarian who “did everything he could” but couldn’t save its life. Sometimes it is justified, but when it is carried to far it make it hard for you to resolving your grief. Depression is a natural part of the grieving process. Prolonged depression leaves you powerless to work through your feelings. Extreme depression can cause you to loose your motivation and energy. This causes you to dwell on your sorrow even more. Acceptance is the last stage in the grieving process. At some point you learn to accept and deal with the reality of your loss. Acceptance doesn’t necessarily mean that you will instantly be happy again. Given the pain and turmoil you have experienced, you may never return to the carefree mood that existed before this tragedy. You will find a way forward and this is commonly known as emotional growth. 3). Dealing with your feelings is all about being honest about them. Denying your feelings of pain, anger, guilt or depression is only going to make it harder to move on with your life. By examining and coming to terms with your feelings you can begin to work through them. Except that you have the right to feel pain and grief. After all, a loving pet has died. Acknowledge your feelings, and then work through them. This can be done in many ways. You can cry, scream, pound the floor, talk to someone about how you feel or anything else that works for you. No matter what you choose, do what helps you the most. Don’t try to avoid grief by not thinking about your dog; instead, reminisce about the good times. This will help you understand what your dog’s loss actually means to you. I found it helpful to express my feelings and memories by creating a website in my dog’s memory. I also wrote poems and short stories. 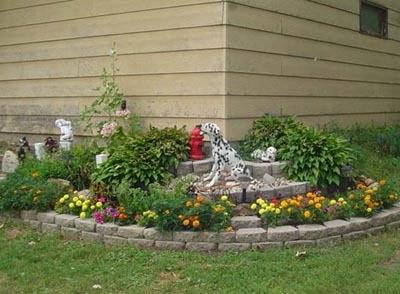 In 2008 I created a memorial garden in my backyard. I spent a lot of time talking to others about his life and my feelings of loss. These people included my family, friends, and other dog lovers. Don’t try to hide your feelings because you think it will show some kind of weakness. Working through your feelings with other people is one of the best ways to put them in perspective. If you don’t have family or friends who understand, you can do like a lot of people have done. There are many pet related websites that offer personal forums where you can post your thoughts and feelings. You can also ask your veterinarian or local humane society to recommend a pet loss counselor or support group. 4). 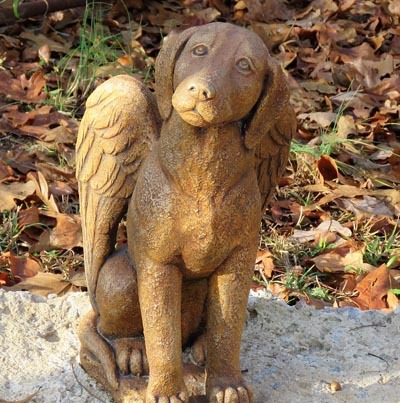 If there are other pets in the house it is also important to realize that they grieve too. They pick up on every change within the home and will notice the absence of their companion too. Pets often form strong bonds with one another. The surviving pet will go through a time of grieving for it’s companion. Don’t forget, cats will grieve for dogs, and dogs for cats and so on. Because pets can’t express themselves verbally, the best way to help them grieve is to give your pet a lot of extra attention and love to help them through. Walking, playing, and spending extra time will help both of you deal with the loss. If you are thinking about introducing a new dog, your surviving pets may not accept the newcomer right away. It is important to create new bonds slowly and carefully and the bond will grow with time. If you have decided to get a new dog right away you may want to re-think it. Usually, it takes some time to deal with the grief and the loss of your dog. You need to be over the grief before attempting to build a relationship with a new dog. If you are still suffering from the loss, you may have moments of resentment or guilt toward the new dog for trying to “take the place” of your old friend. You may also feel that getting the new dog is being “disloyal” to your old dog. When you finally do get a new dog, you should really try avoid getting the same breed or a dog that looks “just like” your old dog because it may cause you to make comparisons between them. That will make it hard for the new dog to shine on it’s own, and it may never be able to live up to your expectations. Don’t expect your new dog to be “just like” the one you lost. You need to allow it to develop its own personality and you need to love the new dog for who it is. In addition, you should never give the new dog the same name or nickname as your old one for the same reasons. Remember: Getting a new dog should ONLY be done because you are ready to move on and because you want to build a new relationship. You should NEVER get a new dog to “replace” the dog you lost. If you are honest with yourself, you will know when you are ready to start a new relationship. When you are ready, select a dog you know you can build another long, loving relationship with.